Khairatabad has a major road junction of five roads called the Khairatabad circle, among the busiest in the city. The largest Lord Ganesh Idol in the world is installed at the Khairtabad State Library during the Ganesh chaturthi festival and is immersed at Hussain sagar lake. Khairatabad Ganesh 2012 has got their first puja to Ganesha on 15 June 2012. Ganesh festival 2012 is on 17 september. As the idol of lord ganesh is so big and it may be height 55 inches. This time laddu Weight is 3500kgs. 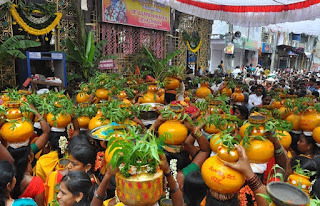 The laddu is divided into 5 parts, as one laddu is about 1500kgs, and 4 laddus as 500kgs. This 500kgs laddu will bw distributed in last four daya of the festival. Khairatabad Ganesh Utsava Samithi has conducted Bhumi Puja on Friday for the construction of Ganesh Utsava murthi for Vinayaka Chavithi 2012. 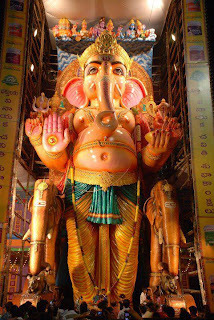 Khairatabad Ganesh is about height of 55 inches, as ganesh idol has ten hands bearin ankusam, pasam, shankam, chakram, trishoolam, damarukam, kathi (knife), dalu, abhaya hastam and laddu. Above the ganesh idol trimurthulu (Brahma, Shiva, Vishnu) at five inches height. Besides of ganesh idol tulja bhavani right side, God son on seven horses at left side. Khairatabad Ganesh every year will have different concept of idol. Khairatabad Ganesh is held total 11 days and on the 11 day the laddu which was placed in lord ganesh hand will be selled and idol of lord ganesh is immersed in Hussain sagar lake. Ganesh idol was the idea of the Rajendran, pencil art work done by the Girish, computerisation by Sharat, and more others involved in the building the idol.